Dueling Axes is at it again, teaming up with the local fitness gurus of The Fitness Loft. Join us at Dueling Axes (before it opens to the public) on Sunday, February 3, 2019 at 10:30am for a special BootCamp and Axes event. Get your grit on with trained fitness professionals where resistance training meets functional movement in this 45-minute BootCamp session. You’ll experience a workout including intervals, circuits and supersets galore, all using body weight and resistance bands. You won’t believe the burn you’ll generate. After the intensity, wind down with an hour of axe throwing. Our professional axe throwing coaches will teach you how to throw and help organize several different styles of game play for all who attend. We guarantee you will walk (or crawl) out of this class feeling like a champion. Coolers welcome! Dueling Axes is BYOB and outside-food friendly! Feel free to bring your own drinks and Sundayfunday brunch food to fuel your body, and recover, while we engage in some friendly competition. Yep, bring bagels, coffee, tea or even some brews (no liquor please) or mimosas to help you throw your best. Workout clothes are encouraged. While you don’t need all of today’s hottest, most technologically advanced work out garb on the market, we do recommend you come in proper workout apparel and athletic shoes. NOTE: you must wear closed toe shoes for all workout and axe throwing activities. A friend, sibling or date (or come solo). Prepare to have some fun! Dueling Axes is Central Ohio’s fun, new axe throwing activity venue located in Downtown Columbus inside the new Mercantile building at 309 S 4th Street. BootCamp and Axes sign up is only accessible through the Book Online Now buttons on this page. Click the button to get to our online scheduling calendar. Choose the BootCamp and Axes event option on February 3. Fill in the requested information to reserve your space and that’s it. You’ll receive a confirmation email with your reservation details and link to our waiver for all participants to sign. Limited time offer and limited to only 30 participants. Book now to take advantage of this special event. Book BootCamp and Axes online now! 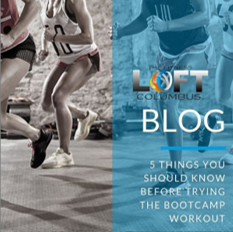 More about The Fitness Loft Columbus: It’s more than just a gym. It’s a visionary approach to developing a sustainable community and creating an atmosphere that inspires people to lead a healthier life. The 25,000 square foot facility is outfitted with state-of-the-art Technogym equipment, which has the ability to track strength and cardio workouts, as well as produce analytic fitness reports. Two large classrooms on the third floor will provide a wide variety of classes, including yoga, Pilates, BodyPump, TRX, and more. The Fitness Loft has sponsored numerous community efforts including the South Columbus Food Plan, which put our neighborhood under microscope to identify ways to boost access to healthy foods and create a business climate that nurtures the growth of local food entrepreneurs. A holistic wellness center located in Columbus, Ohio. Passionate about helping people live a healthier lifestyle. Visit them on the web at www.thefitnessloftcolumbus.com or give them a call at (614) 782-1777. Need to see it to believe it? Take a stroll to 625 Parsons Ave, Columbus, OH 43206.